Greetings readers, before we begin there was the subject of two draws to listen in to recently. The FA Trophy and our colleague Dukey’s favourite competition, the Surrey Senior Cup. In the Trophy it could have been Barrow for the second week in a row however Brackley overcame them in the replay and that is our opponents; and more importantly (for Dukey!) it’s Merstham in the SSC. 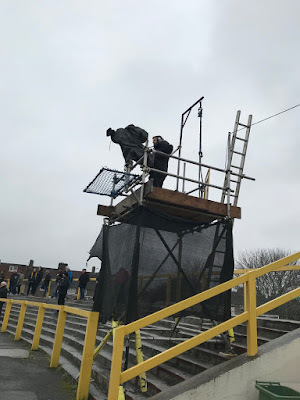 Now on to the game for which this blog is concerned and it’s the return of the BT Sport cameras to GGL for the league game against Dagenham and Redbridge. Our loyal readers may remember I was the author of the blog for the Dagenham home game last season as well, using my A level English Grade B to its fullest in conjuring up the Macbeth line “Is this a dagger I see before me” for my title. This time it’s a song from A-Ha. Which is much the same thing really. With the kick off being an earlier than usual 12:30, it was back to an old Gandermonium ritual of sampling the delightful breakfast at O’Neills. Upon arriving Dukey is the only one there and he has already hit the sauce, too early for me! We all settle down for brekkie whilst laughing at Jimmy Bullard still trying to believe he is a footballer on Soccer AM. Seriously who still watches this programme? Other discussions are on the recent debacle which is the new VAR system. 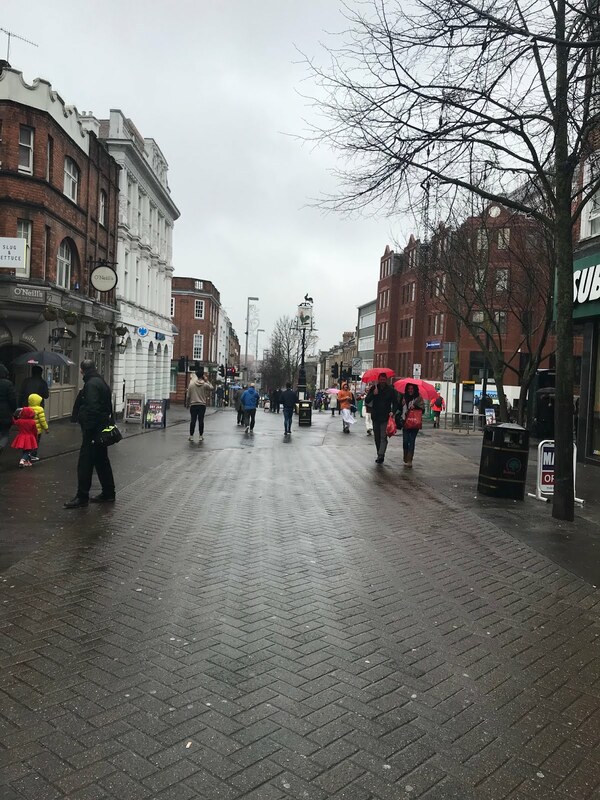 Breakfast done and its time to get the 11:37 round the loop to the PRoWS; upon leaving and heading up the High Street we note are a group of Hare Krishnas – a favourite of ex Beatle George Harrison and a group who most of us thought had long died out. Clearly not! We are met on the platform by Loffers who is heading to her parents’ at Sutton Common and on boarding we next all discuss the global opening of the new online club shop, for which the first order came from the USA. For a shirt in the size of 4 times XL – hey we are a big deal these days. And so it seems was our first customer. Upon entering the clubhouse it’s an awaiting of the BT Sport programme to start and as midday approaches there it is for all the world to see. This is of course set to record at home on my Sky Q box – it’s always interesting to hear what they say before and after the game as well as have a look back on the game itself. The opening segment includes interviews with our Chairman Mr Bruce Elliott, skipper JC, Our Dos and Gandermonium’s very own Totts. The guy is literally everywhere and let us not forget this time last year his song was being blared out everywhere around the club and other places. I'm reliably informed it can also still be found on Spotify to stream/download if you so wish! Look mum, we're on the telly. Again. The teams enter the field and oh no who is that refereeing? Yes its our old friend Mr Rock! What an odious man he is! Anyway, to the action. A delightful cross headed ball by Cadogan was blazed over by Eastmond doing a late dart into the box early on, swiftly followed by a Louis John cross-come-shot tipped onto the bar by the goalkeeper. Young Owen Evans in his third game for the club was showing brief signs of nerves as failure to claim a Daggers’ cross was cleared off the line by the skipper. A highlight of the half from the ex-football league club in front of the TV cameras was provided by Mr Ferrier of the Daggers, who tries to be Neymar only to completely lose sight of the ball and look a fool by kicking it straight into touch. Yeah nice one fella. The woodwork was to be hit again by JC and Louis John after a Harry Beautyman shot was cleared off the line. Today was also notable as this was the first time in ages that I stayed outside for the entire half, even injury time. Still, I had my reasons, Half Time Steve being absent today. I must briefly allude to a conversation that involved flaky pastries, as well as 'certain sizes' amongst Greek and Southampton Steve when poor Natalie is trying to eat a sausage roll, all whilst the latter was hoping not be picked up on camera. Don’t worry Nat I have seen the whole game back and you’re not pictured! Although Greek was on fine form with plenty of decent quips, unlike some but more about that later. Upon heading out for the second half its fair to say we should really be leading and this would have led to more frustration had Michael Cheek stuck away a one-on-one straight at Owen Evans early on. Ok boys enough now, time to get the goal. A corner out to JC was flicked in by Louis John and a Beautyman header is again cleared off the line. 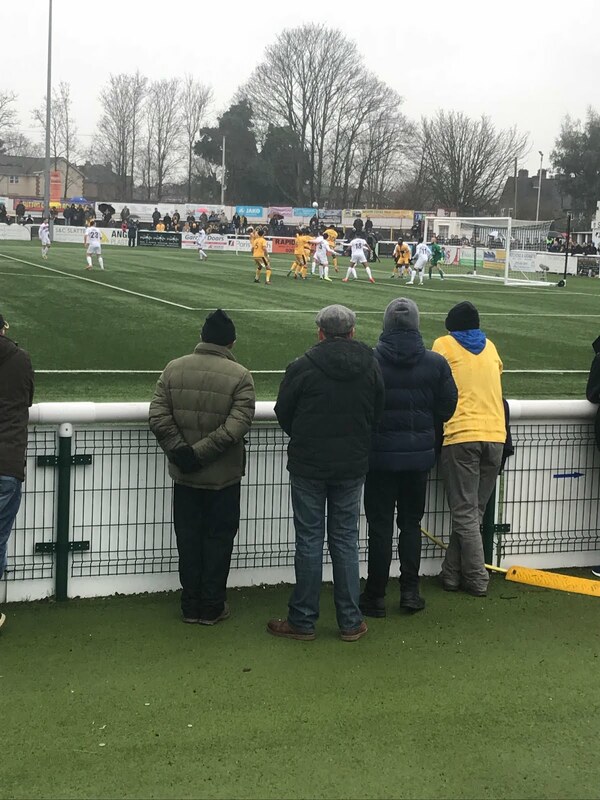 Three minutes later and Chelsea Pete arrives and just in time to see the opening Sutton goal. A disastrous header back by the Daggers’ skipper is picked up by Tommy Wright Wright Wright who subsequently rounds the keeper and taps the ball in for 1-0 on the 58th minute. Then another three minutes later from another corner Tombo gets a free header and he heads the ball into the corner for 2-0. Now as I am taking the picture I ask who scored the goal where I get shouted at by a fellow U’s fan “You should know, your doing the blog”. Sorry, but I am busy taking pictures for said blog. Plus I am also keeping Leanne updated on what is going on as she is absent from today’s game. I can't do everything! We're a supporters club now?? Subs were Josh Taylor for Tombo on 83 minutes and Dundo for Tommy Wright on 87 minutes, yellow cards to Kenny Davis and Owen Evans for timewasting. An attendance of 2077, with 139 Daggers fans making the trip. 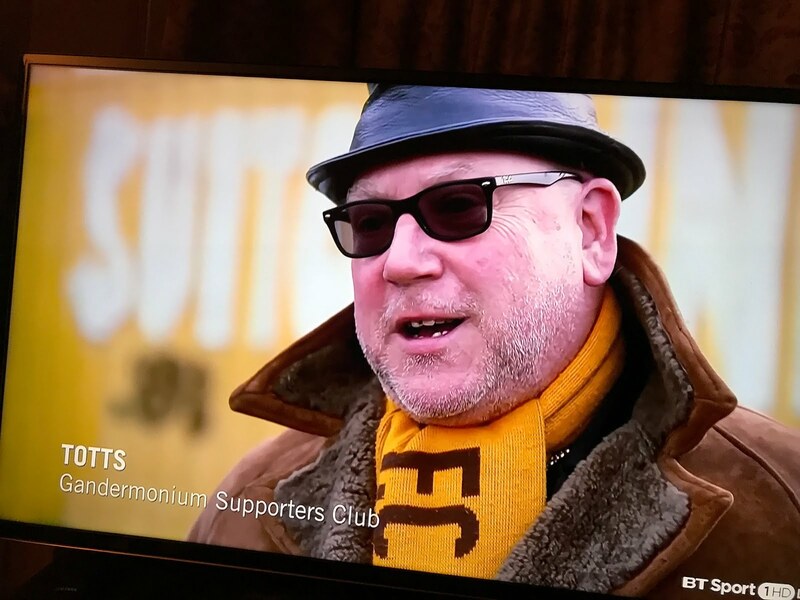 On the TV coverage there is interviews with Tommy Wright and JC, as well as with Dos – of course no one can hear anything being said as the bar is noisy, but this is why I record such things so that I can watch it back in comfort later. In the players bar it is approaching three o’clock and this is where we are expecting to be heading out for the game. Strikers are Key is up next with our very own AB – and the number pulled out is Number 7 – just the one shy of mine and Nat’s – so close, but the safe is not opened sadly, so the pot rolls over. Maybe next time? I head to the VPs for a little while, which as a VP myself I am of course allowed to do, and have a good conversation with Our Bruce, he says he has never been mentioned before in a blog, which I find hard to believe. I am sure I did before, however just in case here is another mention for you Mr Elliott. 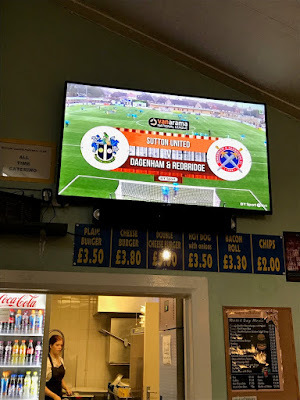 News then filters through from the games taking place at a normal time that Macclesfield have lost six, yes that’s six, nil to Fylde which lowers their goal difference somewhat and brings the gap down to three points between them and ourselves. The pool table gets an airing and I again get to grips with my role of being the world’s fairest referee – as the lads take part in a game of Killer. I’d say I am certainly a better ref than Mike Dean and of course Mr Rock from earlier but I bet they do not use napkins for keeping notes. Mainly as they get given those little notebooks. As the drinks start flowing, the shots get worse (sorry chaps) but congratulations to the winners (sorry I've forgotten now who won!). Although I end up having a match versus Millsy in what turns in to be two tight tactical battles which dear readers I unfortunately lost. 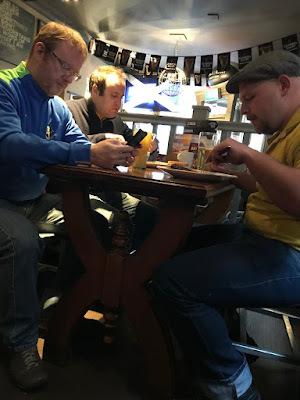 More and more people leave the bar and talk turns to food – Dukey and I head back to Mr X’s for Chinese leading to discussions about Helen McCrory (if that’s how she is spelt) and Dukey saying she is 'decent' – no Dukey she is not! As we watch Match of the Day Dukey and I notice that Mr X has fallen asleep and I decide to call an Uber to drop us both home. Now I think about it we should probably have done the washing up for Mr X! Rather rude of us that. Thoughts now turn to the next game, away to Barrow. Safe journey to all going up, bring back three more points.